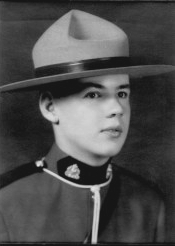 Constable Behan was operating his cruiser westbound on Highway 7 between Maberly and Silver Lake. He was accompanied by Constable H. Crain. After rounding a curb the vehicle entered the shoulder of the road and went out of control into the south ditch striking several tree stumps. Both officers were thrown from their vehicles. Constable Behan died at the scene. Constable Crain survived.